Gingerbread Village: Gingerbread House 7 [C7101] - $6.50 : Yarn Tree, Your wholesale source for cross stitch supplies. 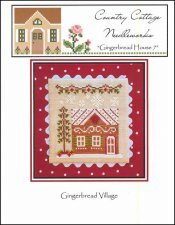 Chart ten in the Gingerbread Village series by Country Cottage Needleworks. A gingerbread house with peppermint striped roof and swirls of icing above the windows. Stitch count 55w x 60h.